Homepage. This page: Interesting motor touring leaflet issued by a well-known household brand. Holiday Tours - day trips along the South Coast. My guess is that this rare publication dates to the late 1920s, or early 1930s, judging by the typeface used, and the style of the colour illustrations. It was given away by the Smith's Crisps company, and each page inside features a different ad for their products, in addition to a recommended tour suggestion. The cover shows a smart '20s motor-car, perhaps an Austin, with dad at the wheel, sucking on his trusty pipe, with mum and daughter alighting, to admire the view and collect the wicker picnic hamper that was no doubt strapped to the rear luggage rack. 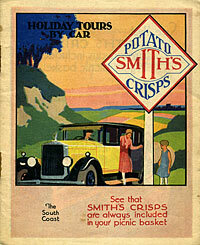 The Smith's advert on the cover is incorporated within a stylised road sign, sort of, and is a nice touch, supported by a note to "See that SMITH'S CRISPS are always included in your picnic basket". This leaflet covers motor-car tours around the South Coast, so I'm assuming that similar leaflets were printed covering others areas of the UK. 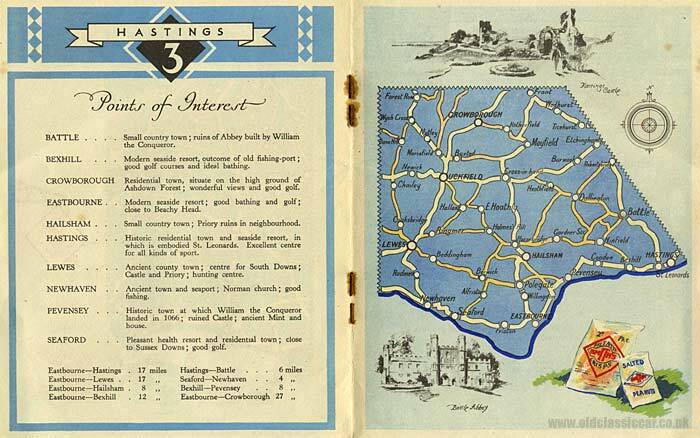 Open to the first page, and the reader is given a cordial welcome: "This little book of maps is published in the belief that it will be of assistance to motorists and other spending their holidays around the South Coast. At the same time, it will serve as a reminder of the delightful variety of Smith's Products so useful for picnics and other occasions". 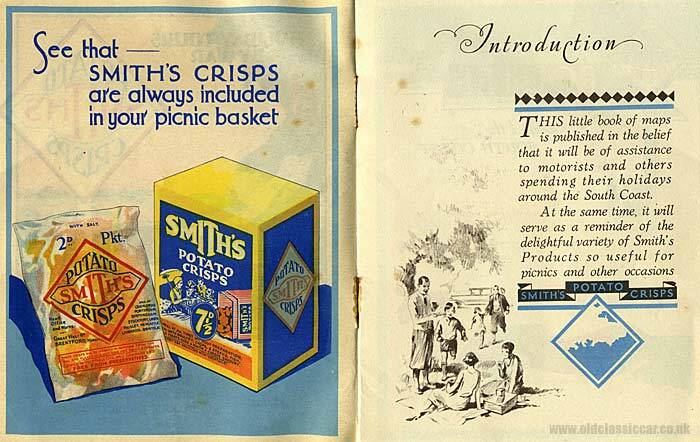 A fine colour advertisement faces this page, showing crisps in both packet and cardboard box. The address of the company is neatly given on the cover of the packet, with advice that "These crisps will be improved if removed from the bag and placed in a hot oven for about 2 minutes". For each route, a handy map is provided, along with a list of interesting things to look at in the nearby towns, whisked there in the comfort of your horse-less carriage. Southampton is the description that most caught my eye: "Large town and important shipping centre; magnificent docks, at which may be seen the largest Atlantic liners; good centre for New Forest and coast resorts; service of steamers to Isle of Wight".